MessHall stands in the storied walls of what was once Willard’s Chicken Inn, and later The Brown Derby. During the “Golden Age of Hollywood”, legendary film director Cecil B. DeMille opened Willard’s Chicken Inn, a country-colonial chicken restaurant that quickly became the place to be for Hollywood’s elite. The building’s unique dome-shaped roof allowed for a water pumping system that made it one of the first air conditioned restaurants. The structure was designed by influential architect Wayne McAllister, credited with creating some of the most popular mid-century drive-ins and car hops..."
Whoopteedoo! New restaurant...gastrosomething...local ingredients...neato buildiing. Travelogue! The question was, could Messhall serve up a competent cheeseburger? I hoped so, because getting from the Westside to Los Feliz on a Thursday evening was like going to the moon. It took a long time in traffic. I paid my $4 valet fee, located my dining companion, found seating, and ordered a $15 Mess Burger. 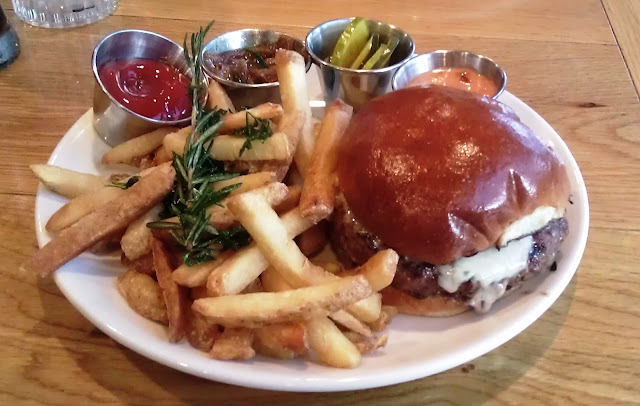 The server was surprising knowledgeable about the burger, and this was refreshing. Cheeseburgers appeared at the table within 15 minutes. The Beef: Messhall used a pre-ground, blend of Brisket, Short Rib, and Chuck from Rocker Brothers. This combination of beef cuts from this purveyor has generally resulted in solid wins. 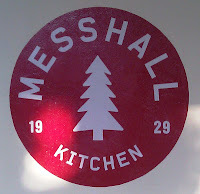 Messhall was not an exception to this rule. The 8-ounce patty was juicy but not obnoxiously so. The flavor was solidly beefy with just a hint of funk from the Short Rib. There was iron from the blood. The fat content was at 20%--the burger was not at all greasy. The Brisket provided its customary fine-grained mouth feel following the firmness of the Chuck. This was right up there with some of my favorite steakhouse burgers. The beef bordered on perfection. 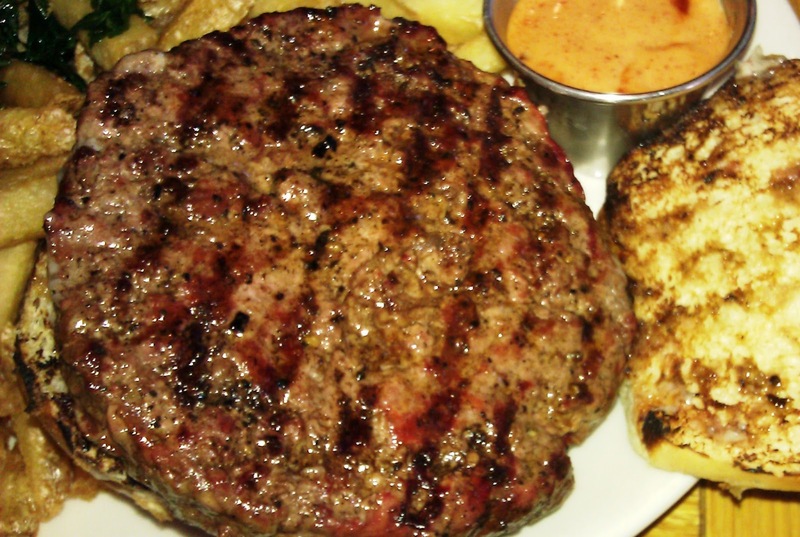 The Seasoning: Messhall applied the proper amount and proportion of salt and pepper to the exterior of the burger patty. This was just enough to make the beef flavor pop without masking any of the nuances brought to the dish by the Short Rib or the spectacular Vermont White Cheddar. The Sear: Meh. This was my sole qualm with the cheeseburger at Messhall. All of the other elements were there, but the sear was missing. I really wanted a crisp, hearty sear. What I got were lackluster grill marks and no interesting shift in flavor or texture. A thorough sear would have taken this burger to a better place. The Preparation: The burger patties were thick, flat, and relatively uniform. They were formed during the prep cycle from the pre-ground, pre-blended beef. The patties were formed gently...just firmly enough to hold together on the gas-fired grill. My burger appeared to have been turned 3 times, and this partially explained the lacking sear. 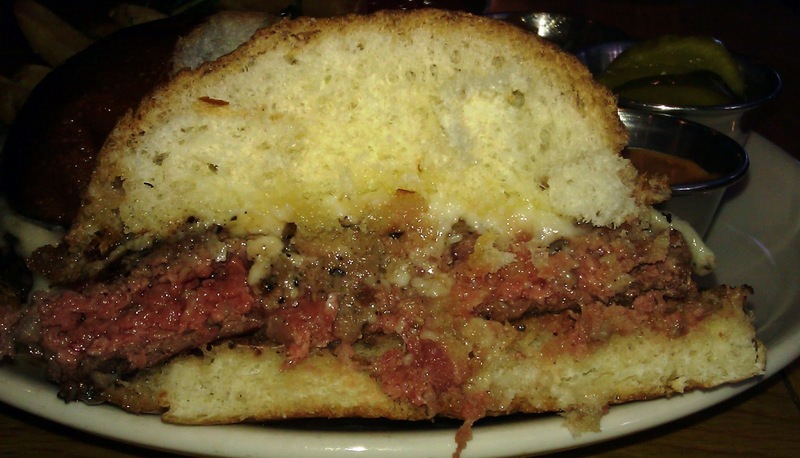 I ordered a Med-Rare cheeseburger--I was served a Med-Rare cheeseburger. The Cheese: The Vermont White Cheddar was phenomenal. Its fine, salty graininess worked perfectly with the Brisket. The Cheddar melted nicely to lend creaminess to the dish. The iron and tangy notes weaved seamlessly throughout the bite to complement the beef without drawing focus from the beef. The Bun: The bun came to Messhall Kitchen and my plate courtesy of Short Cake LA. While Short Order served up over-priced and poorly considered burgers, the sister bakery, Short Cake LA, made some darn fine burger buns. My burger arrived on a mildly sweet brioche. The brioche was light in the manner of fluffy cake. This was, mercifully, lacking the customary hit of butter and punch of yeast. The bun was a silent bystander with the sole purpose of transporting meat to mouth. In the case of the Messhall Burger, this worked. The Fries: Hand-cut, Belgian-style (par-cooked), well-seasoned, perfectly browned, with creamy centers and crisp exteriors--the fries were a winner. The Toppings: The house-made ketchup was a runaway favorite. This was a traditionally smooth ketchup with a wonderful punch of house-smoked tomatoes. The other smokey sauce was a version of 1,000 Island dressing, but made with smoked, ground Casabella peppers--the dried peppers that many establishments use as ornamentation. The Value: $15 for a 1/2 pound burger and fries was a little steep, but the ingredients were of very high quality. With that taken into consideration, the value was average. Messhall Kitchen served up a very good cheeseburger. The ingredients were solid as was the preparation. This was the best burger sampled to date in that part of Los Angeles. 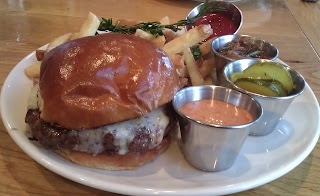 Burger Review: Great cheeseburgers and great service at Messhall in Los Feliz.